Does SEO really work? The answer is yes, if executed properly. What is it? Search Engine Optimization. Optimizing your website so that your customers find you in the search results to draw more leads and awareness for your business. There is not one answer to meeting all your digital marketing needs, but when thinking about a good place to start, let’s talk about your website. Your website is more important than ever. It’s your digital home, how you attract and educate your customer. It’s your ultimate digital marketing tool, if used correctly. Let’s use the analogy of a foundation for a home. When you build a home, you dig the foundation out and construct first. Usually unflashy and built on solid materials, the goal here is something your house can sit on to successfully last the test of time, supporting the rest of your home and all the good things in it. Transfer that thinking to your website. While design and copy are paramount, you need a solid website optimization strategy first and foremost. By that, we’re talking about an approach to development that will make your site work efficiently for your business. Remember, this is before you launch any marketing at all. Choosing a CMS to develop your website in is crucial. At Mole Street, we focus primarily on customized WordPress websites. We find that WordPress is effective, relatively simple for the owner to operate and can handle most needs. However, there are pros and cons to everything. In general, it’s best to choose a CMS that is powerful but we suggest starting simple and growing from there. You can always improve your website, but your goal should be to pack light at first and leave room in your suitcase so that, as you progress down the road, you can add functionalities to your website as the needs come up. The best bet here is to talk through this piece with your agency so that you can decide together on the best CMS for you. This will help you effectively combine business needs and wants with the agency’s recommendations for successful future marketing. Mobile first means designing your site to be mobile responsive and prioritizing this before desktop design. Your website has to be functional across all mobile platforms. That means anyone picking up a phone, tablet, or any other mobile device needs to see the content when they pull up your site. It should be better on mobile than it is on desktop. Think about how and when you search for things you need or want, and what you use to perform that search. That should prove just how important mobile is. Our approach from a design perspective is always to design for mobile first and then for desktop as we’ve found desktop to mobile designs are much more complicated to get right. Google understands this too, so if your website isn’t mobile responsive, Google gets mad at you. Nobody likes a slow page loading speed, especially Google, so pack light. When you are uploading images and videos, it’s important to always compress and manage the file sizes. In fact, there are a lot of factors that add up to a slower loading rate. Page Size – Try to keep your page size below 3MB for optimum performance. This means compressing images and videos to make sure you manage page size. Page Requests – Combine files to minimize the number of HTTP requests your site makes. Page Speed – The best websites on the web have pages that load within 3 seconds. The following are four essential elements that should never be overlooked when optimizing your website for SEO. Page Titles – This is exactly what it says it is: the title of your website page. Make sure the title, commonly known as the title tag, includes the most important keyword you want the page to rank well for. No more than 70 characters. Each page title on the website should be completely unique. Meta Descriptions – This is the one line description below the website link on the search engine results page (SERP) on Google. Think of this element as your call-to-action on the SERP. This is your best opportunity to cue the users in on what they can expect once they land on your page. 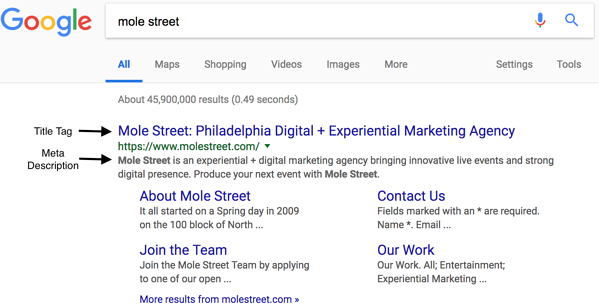 Example of Mole Street's title tag and meta description as they appear in the search engine results page. Headings – This is the top heading of each page and most likely the largest, most emphasized copy communicated on the page. The heading, also known as the H1 tag, is one of the most important on-page SEO elements because it is the highest level tag that shows what your specific page it about. Make it count. Example of H1 tag on a landing page. Site Map – When you plan a website for design, you create a sitemap. This is a visual layout of the pages on the site. For SEO purposes, you will need to organize this site map based on the URL’s of all the pages and install on the site. This allows easier crawling of the site for Google... and they like that. Website security has become best practice for all businesses. If you want to optimize your website for SEO, establish credibility with visitors and maintain a professional web presence, your site must be secure. In order to secure all of your URLs, you'll need an SSL Certificate. Talk to your development team about this. They will help to ensure the URL of each page on your site shows as https:\\ vs. http:\\. There are plenty of ways to test your current website’s SEO score. Not all of them are 100% accurate, but most provide a good glimpse into your most significant areas of opportunity. One simple and free tool that we use, amongst others, is HubSpot Grader. HubSpot is an industry standard automated marketing platform, with lots of bells and whistles. 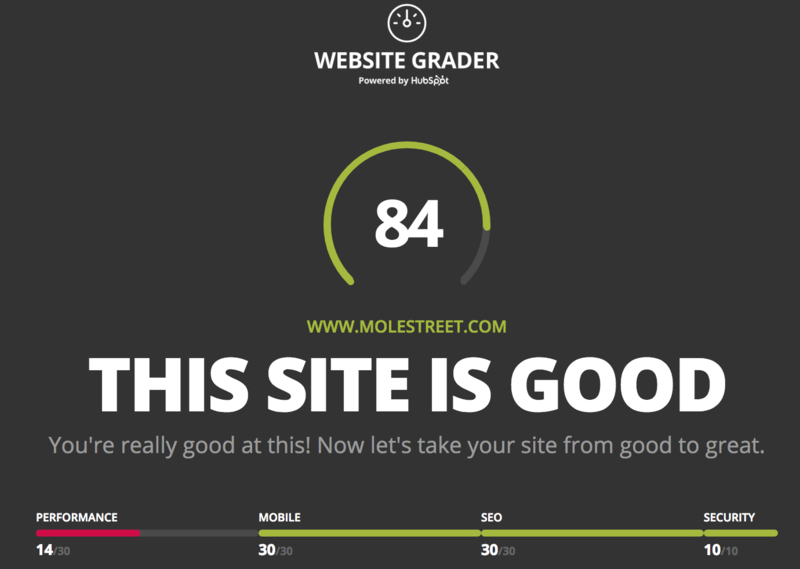 That said, this website grader function is perfect for those looking to get some insights about how their SEO foundation is stacking up on their current website. As you can see, there are a number of key steps to take in order to optimize your website for SEO. Having a strong SEO set up will help you achieve success with your digital marketing objectives. Get the right team and make sure the boxes are checked. Build that foundation so your website is strong, gets you leads and grows your business. Once you've completed the technical setup, it's time to start creating relevant content. Click here to learn about the benefits of blogging for B2B. 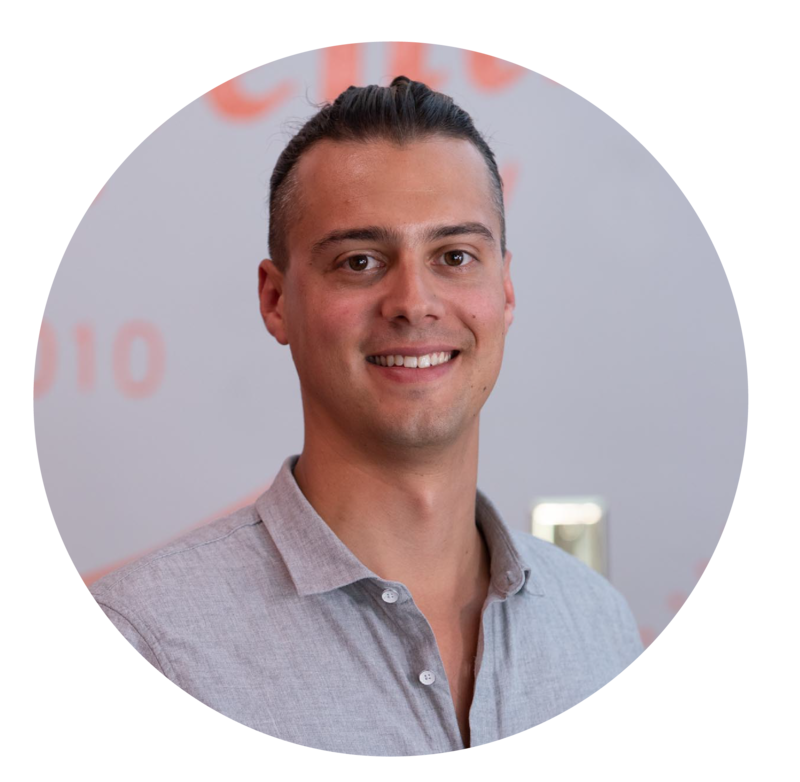 Get in touch with Brian and the Digital Services Team at Mole Street to schedule a complimentary SEO audit today.